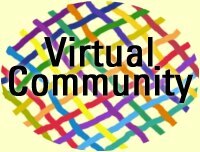 Virtual Community is more. It's a way of looking at how the different elements of your online presence interact to support relationships. Online businesses know they need it to reach customers, partners and employees. But the 'For Profit' world has much to learn from Nonprofits. We have always focused on community. The community life cycle - In the rush to get online, many nonprofits have forgotten relationships. Virtual community has four important stages (see the mouseovers in the graphic above). In stages three and four -- driving participation and encouraging evangelism -- virtual communities produce true value for your organization. Stickiness - there has to be a reason for people to return to your site after the first visit. Word of Mouse Marketing - your web presence will be most successful when people tell one another about your site. Relationship Building - The Internet comes most alive when it becomes a tool for sustaining relationships. Knowledge Sharing - From its earliest days the guiding spirit of the Internet has been that of sharing resources, tools, ideas. It's still the lifeblood of being online. If you need a cost-effective means to build and maintain relationships online, Affinity Resources has the skills to plan, design, and implement your vision. Virtual Communities augment face-to-face community as you build and maintain solid relationships across a broad swath of stakeholders and consumers. Effective fundraising online begins with implementing basic, community-focused fundraising principles. Then it combines them with new and evolving techniques of relationship building, e-commerce, Internet marketing, and Web design. Unprecedented access to a enormous pool of donor prospects exists, willing to seek out organizations, rather than the other way around. Know how to market your site! On and off line, people need to know how to find you! E-mail provides a quick, inexpensive contact with your donor community, but do you know how to personalize it for every individual? Organizations will not benefit from the Internet if their website is too complicated, too boring, or just unattractive. Users return to sites that do more than feed them information. Through our sister organization, Affinity Web Design, we offer the best in web design at rates that are discounted for nonprofit organizations. For more information, click here.